Carole is Co-Founder of Project Blue Collar. 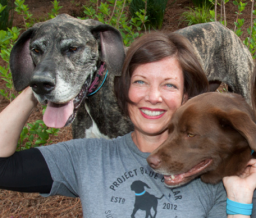 She is a lifelong animal lover and rescuer. Although her career path was always in Business Development, the majority of her career with American Express, she always spent her spare time working with animals. She has studied conservation around the world and travels to Africa frequently as a “voluntourist.” She is also a foster mom for Stray Animal Adoption Program (SAAP) and has fostered hundreds of pups. So many that she calls her place the PBC Puppy Hostel. She finally decided that she needed to turn her passion into a full-time job and launched PBC in 2012. Carole has many talents, but finding the perfect home for the many rescues she fosters, is perhaps her greatest one. Ask any of her friends, both two legged and four legged and they will tell you that it was Carole who helped them find each other. Carole holds a B.S. from Eastern Kentucky University. Kristin Waters is Co-Founder of Project Blue Collar. Kristin brings her extensive background in sales, fundraising, design, and writing to PBC. No stranger to the startup environment, Kristin held key business development positions at several dot coms in San Francisco in the late 90’s. She also held fundraising positions at several secondary schools where she learned the true power of giving back for the common good. A native Californian with an affinity for nature, Kristin has channeled her passion for animals into volunteering at Save the Animals Foundation in Cincinnati and actively networking behind the scenes for animal rescue since 2006. Her other passions include the sport of squash and exploring and enjoying the state of Maine. Kristin brings her years of experience and passion to engaging the PBC community and ensuring the integrity of the PBC brand through strategic marketing initiatives. Kristin is a graduate of Cate School and holds a B.A. in English literature from Bowdoin College.